The driving simulator that fans experience before Dallas Cowboy home games this season as part of AT&T’s Every Drive Matters and It Can Wait campaigns is just one of a fleet of simulators that the telecommunications company deploys in its efforts to deter youth from texting and driving. 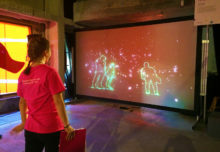 By the end of 2013, AT&T will hold 400 simulator tour event days, more than 150 of them at high schools across the nation. 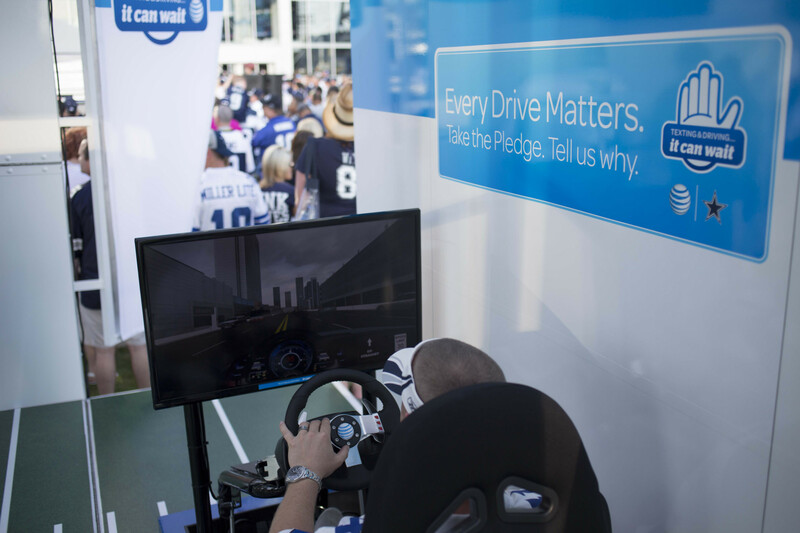 So far this year, the company has had more than 300 events involving 22,000 simulator participants and more than 50,000 pledges to not text and drive that are captured onsite at simulator events, contributing to the now more than three million ICW pledges to date. Here’s a closer look at AT&T’s fleet of simulators, which include chair and car styles, and even a virtual way to get behind the wheel. This is a car seat that has been modified with a screen attached that shows the virtual simulator. People get into the car, buckle up and watch the screen, which gives them a view as if they were actually driving a car. Outfitted with a steering wheel and pedals, it feels as if the “driver” is really on the road. The driver is given a smartphone that is synched up with the simulator, and when text messages appear on the large screen, they text back. The simulator tells them how fast they are going, if they have crossed the center line in the middle of the road, if they are about to crash or went through a red light, just as if they were driving. AT&T has four chair simulators, which are easy to manipulate and move from place to place, often visiting several schools in a day. 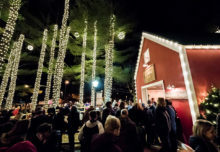 Besides the one at Dallas Cowboys home games, one is installed on a branded Fan Zone tour truck that travels to various amateur and professional sports properties this fall and winter; one is on tour in a branded van that primarily visits schools and community events; and it has an extra one available for one-off events. In addition, USAA became a simulator tour partner this year. 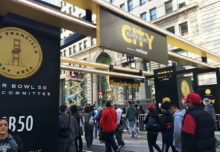 The insurance carrier purchased its own chair and reaches out to military events and bases throughout the country, and also co-sponsored a few AT&T simulator events. Like AT&T, it has garnered pledges, as well. 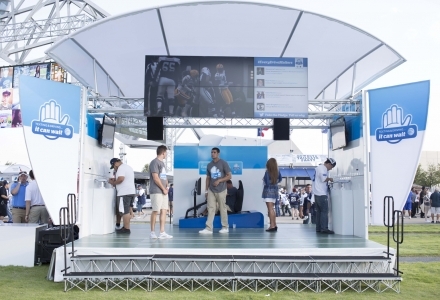 AT&T has partnered with Peer Awareness, a non-profit group dedicated to spreading the word about youth driver safety, which rents a car locally, outfits it with a simulator and brings it to events and festivals. The experience is similar to the chair simulator. The driver presses the gas and brake pedals, but views the road and passing scenery and the car as it moves virtually on a pair of goggles, for a more video game-like experience. Passersby can view the results on an attached monitor as the driver texts and drives. AT&T also has a free, online virtual simulator that drivers-ed teachers, schools or anyone with a smartphone can sync up to in order to test out their texting and driving skills. You can find it at itcanwaitsimulator.com. The results speak for themselves: In year-to-date surveys taken onsite at simulator events, the percentage of people who said they will never text and drive increased from 52 percent to 79 percent after participating in the simulation. Agency: The Marketing Arm, Dallas.